One of the latest arrivals to the burgeoning gin scene Whitley Neill is a new premium London Dry Gin, independently owned and created by Johnny Neill, the fourth generation of the Greenall Whitley distilling family. 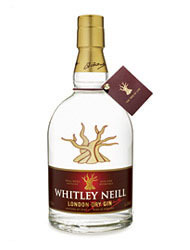 Although it’s a newcomer, Whitley Neill is firmly embedded in the centuries old tradition of English gin making. Not surprising when one considers that distilling is in the blood of its founder. Whitley Neill is a handcrafted gin made from a 100% grain spirit which is steeped with the botanicals prior to distillation in antique copper pot stills. Nine botanicals including the traditional juniper and coriander make up the botanical recipe. But the producers of Whitley Neill are taking gin to a new level with the inclusion of two carefully selected signature botanicals from Africa – the Cape Gooseberry and the fruit of the Baobob tree, the tree of life. Hence the distinctively bold taste of this superb gin. The taste experience starts with a spicy freshness on the nose. Laid back juniper and citrus combine with the fresh tanginess of the wild fruit to create robust yet delicate and clean flavours. A pleasant lingering finish holds those flavours in the mouth whilst an alcoholic strength of 42% abv ensures perfect balance. Not content with reinventing gin, the producers of Whitley Neill have also come up with some new twists on favourite gin drinks. So the Baobab Bliss is the G and T with knobs on adding fresh ginger root, lemon juice and honey to the old stalwart. The Whitley Sour is a delicious combination made from gin, passion syrup and lemon juice garnished with passion fruit and lemon. You’ll find Whitley Neill available in exclusive bars such as The Player, Albannach, Fifteen, Dusk, Loungelover and other top style venues.